We know homepages get a lot of love and portfolios tend to steal the spotlight, but if we had a designer specialty, it would probably be the oft-neglected, underdeveloped little sister of the website world: the about section. We’ve worked with some incredible personality-based brands over the last few years—people like Jenna Kutcher, Katelyn James, Justin & Mary Marantz, Amy & Jordan, Hope Taylor, The Scobeys and more—and one of the many, MANY things we’ve learned from them is the vital role personality can play in compelling your ideal client to choose you. And not the “Out of the twenty unemployed men with the same haircut in this room, I want YOU to have this group date rose,” kind of choosing. Like the, “Out of every [photographer] in the world, YOU’RE the only one I can imagine [shooting my wedding]” kind of choosing. In the world of social media, there are an ever-increasing number of platforms for you to showcase your personality should you so choose (we can battle it out over Snapchat vs. Stories in the comments). But the about page on your website is a tool we believe many creatives simply don’t know how to approach. We’re not saying the reasons aren’t valid: “It’s hard to write about yourself. Is there literally ANYTHING interesting about me? But I liked pumpkin spice lattes BEFORE it was cool. Fine, here’s a picture of my dog…” But as a result of any number of those *cough* excuses, *cough* most business owners neglect it, and thereby give up an incredible opportunity to connect with clients who are desperately trying to form a connection. Well, GIVE UP NO MORE, friends. Let’s tackle this situation together. This is the step so many people miss, and why we stare down our blinking cursors for hours, trying to figure out what to say. How can you expect to know what to say when you don’t know who you’re talking to? There’s as reason why we’re wired to enjoy conversation more than public speaking, or talking to an empty room. Before you start writing your bio, think about your audience. Who are you talking to? Where do they live? What do they like? What do they wear? What values to they hold? What lights them up inside? What are they looking for? How can you expect to know what to say when you don’t know who you’re talking to? When you start with a clear knowledge of who you’re hoping to reach, you can begin to tailor the rest of your content to resonate with your caricature of that person. This isn’t a mark of insincerity – it’s a strategic way to present the parts of yourself and your brand that are most relevant to the clients you want to attract. Here’s the thing: Your clients are looking for a reason to book you. 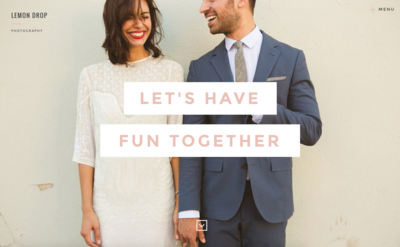 They’re looking for something you have in common – for the foundation of a relationship with you, or something in your story or your work they connect with. Think about the last time you were caught in an endless cycle of small talk, and the relief you felt when you finally found something in common with the person you were chatting with… the power of the “OMG, ME TOO.” We’re wired to crave connection. So, how do you decide which “connection points” you want to create? Start by asking yourself some key questions about yourself, your client, and your brand. What do people talk about when they talk about your brand? What are you known for? What things are you constantly doing or talking about that people associate with you? Or, are you realizing that you DON’T share connection points and you need to? We talk about this pretty extensively in the webinar, so if you want to hear the best examples of connection points we’ve heard from our clients and industry influencers, you may want to watch, too. But for now, we’ll just say that if you know your ideal client is a super warm, friendly and romantic young woman who wants to feel like her photographer is her best friend, you need to show yourself friendly, be warm, and talk about why you believe in the magic of everyday romance. If you love sprinkled donuts (Hope Taylor), mac and cheese (Jenna Kutcher), or your daily nap (Jeff Shipley), and you know your client will “ME TOO!” at your everyday relatability, then share that. If you appreciate the balance of a well-crafted cocktail… well, HELLO THERE, FRIEND OF TONIC. Now it’s time to go a step further and round out these points of connection with story, layers and detail – the “magic” Seth was talking about earlier. Let’s just get this out of the way: we know you love coffee. Like 90% of the world loves coffee (our own Jeff Shipley being a notable exception, much to Jen’s continual amazement). Which is why it’s not enough to talk about your pumpkin spice latte* or show a Starbucks cup in your “favorite things” section. You don’t want to to be the 18th, totally un-memorable guy on the group date —the one who doesn’t get any screen time. So, how can you limit the scope of your connection point so that it applies to YOU? Simple: you’ve gotta add a layer. Show people why that thing you love actually means something, and why they should care about it, too. Why do you love coffee? Is it the ritual? Is it the comfort? Is it the only possible defense against the joyous demands of life with toddlers? Tell a story. Paint a picture. Go deeper. Show people why that thing you love actually means something and why they should care about it, too. We love that Justin & Mary talk about wedding photography in the context of history, legacy and leaving something behind… because you know that as soon as their ideal client reads that, they say “YES.” Even if they didn’t care about their legacy before, you can bet that they do now! And they want a photographer who cares about it, too. Justin & Mary’s “The Legacy” section is like the movie trailer version of everything they stand for, and it’s unlike anything we’d seen before. After you’ve determined your connection points, make sure you add a layer, and then if necessary, add another layer until its scope narrows right to you. Because no matter how ordinary you feel, there’s someone out there looking for exactly what makes you different. *Disclaimer: If you love pumpkin spice lattes, we’re not saying you shouldn’t share that, because chances are, your ideal client proooobably loves them, too! We’re just saying you should think about WHY you love them, and share that, too, so that connection is more unique to you. Now for the fun part: bringing your about section to life and making it pretty enough that people want to read it. We’ve got lots of tips on how best to accomplish this, but one of the methods we’ve found to be most helping for deciding HOW to present who you are, is to look off the web for inspiration and to editorials and other tangible design. We love flipping through our favorite magazines and finding a cool editorial layout to riff off for about section just a little bit differently than a standard 5oo word bio and justified image on the side. We’ve created so many different versions of the “favorite things” section, we’ve come up with a million different ways to share a brand’s personality and philosophy, whether it’s fine art, incredibly personal, editorial, southern, city, charming, etc. The most important thing is that the style of the design matches the tone of the content. 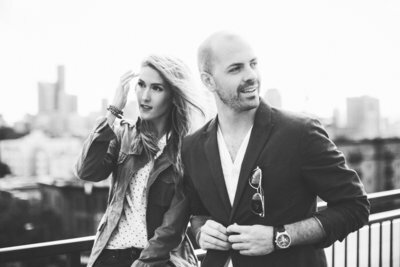 Jenna Kutcher’s Cosmo-style interview – straight from the editorial design playbook. The Scobey’s custom-illustrated timeline… The concept may not be new, but the execution is so tailored to their brand, their ideal client and their story. It’s worth taking the time to not only show what makes you different, but to showcase it differently, too. First up, Lemon Drop. This one skews more cool, minimal modern, but the color-blocking and tones make it super fun. We love the “philosophy” section in the middle on the photo that shows the things most important to you and your brand in a really dynamic format. 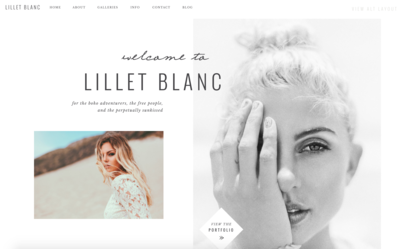 Lillet Blanc is more of a Free People-inspired, bohemian situation – lots of space, limited color, and a really personal-feeling script font. The “favorite things” section is one of our all-time favorites. This snippet from the Negroni about page is proof that you can do minimal and fine art but still have it feel different from every other photographer with lots of space and a white background. Layout and scale are such powerful tools. Our romantic, Parisian-inspired Rendezvous uses a well-curated color story and a few featured images to great effect. This is actually the bottom of that page, but we wanted to show how the instagram-like favorites make such a huge statement when you see them all together. Where do you think we got that idea from? And Jack Rose uses signature details ( like the key lines, script font, and the printers’ ornaments ) to keep its about section modules from being too spare or block-y. We love that big pull quote at the top of the manifesto section – so even if people don’t read the rest of the text, they’ll get the most important part. If you need more inspiration, we’ve listed a few more favorites at the bottom of this post! 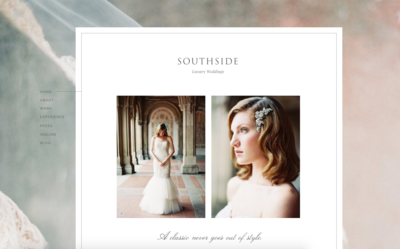 Ready for some serious about page inspiration? From the TONIC Collection Lemon Drop, Negroni, Lillet Blanc & Rendezvous. And of course, the all new TONIC! Have a question about connection points, narrowing your scope, or the whole Nick vs. Luke situation? Take it to the comments, and we’ll reply there! Oh, and make sure you check out the webinar replay, too. Our most affordable sites ever, served neat and simple, straight up, but still totally #tonicapproved. Everyone's favorite macaroni and cheese lover on the biggest light bulb moments in her brand, the essentials in her carry-on, and her best advice for a designing website that's unmistakably "you." Need a shot of Shopify for your SHOWIT site? Here’s e-commerce with a TONIC twist. Grab our fully styled, embed-ready a la carte shop add-on, modify to fit your design, and plug and play your way to the prettiest sales platform around. Shopify + Tonic: A Shop Page Add-on Just for You. Creating connection points, narrowing your scope, and all the inspiration you need to make it your own. Get on the VIP list for exclusive deals, design tips, cocktail recipes & more. Ready for a little TONIC in your inbox? 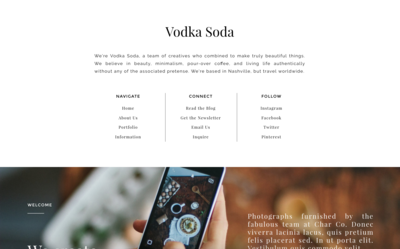 We send occasional, moderately witty emails with exclusive deals, design tips, recent blog favorites, cocktail recipes, and more.